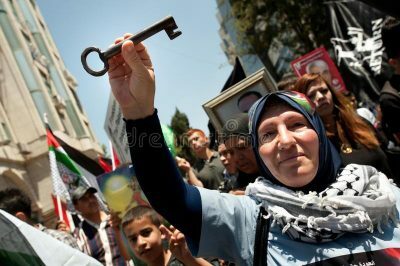 The answer is that the Nakba is not only an historical trauma but an accumulative affliction that continues to harm Palestinian identity, both collectively and individually; the Nakba is an ongoing injury that has never been bandaged or healed. The Nakba is a contemporary insult renewed with every Palestinian who is humiliated, arrested, and killed; salt is added to the wound of the Nakba with every demolished home and every bit of confiscated land. The memory of the Nakba is not kept alive by the key that moves from the hand of the grandfather to the hand of the grandson. The memory lies in the damaged identity and self-image that has been thrust upon us and which is passed from generation to generation. We inherit the Nakba from the oppressed, expelled generation which came before–an anguished heritage which carries bad memories as if our genes themselves were anguished. Neither an attempt to forget or the senility of old age can dispel these memories. Silence cannot undo its shocking impact. On the contrary, commemoration of the Nakba is necessary in order to understand the present and to redress the injury of the past. A collective trauma requires a collective healing through popular narrative, rituals, and symbolic representation, as well as restorative justice. Silence and denial will only deepen the wound and inflict future calamities upon us. “But the Palestinians who approach the fence in Gaza must be suicidal!” proclaims my colleague emphatically, without curiosity about the thoughts and feelings of these Palestinians. My colleague’s quick diagnosis does not acknowledge that these Palestinians may intend to communicate a need, may intend to alter the unchanging conditions of the status quo. These Palestinians may intend to protest the theft of their land or the siege or the partition of their people. But by making a quick diagnosis, my colleague forecloses the opportunity to listen and to negotiate better strategies; by drawing judgments on the basis of surface behavior, genuine understanding is short-circuited. There is a difference between the psychological profile of a person who attempts suicide because of personal problems and the person who undergoes self-sacrifice in the context of social struggle. The suicidal person is hopeless and desperate, withdrawing from others pessimistically or fearing to be a burden upon them. Suicidal actions are often egocentric because the individual’s spark of life has lost its meaning in interpersonal terms. In contrast, the self-sacrificing person–even on the pathway to death–may be full of hope, indeed perhaps too much so. The act of self-sacrifice often involves an altruistic dedication to others and an eagerness to improve their future chances. Their hope is to extinguish their own soul in the service of giving light to others and brighten the road ahead. I remember a dream that I had a few years ago. I was walking in the darkness and beheld creatures with brown fur walking slowly on their four legs. Every now and then, one stopped and turned its head upwards. It was too dark to see clearly, but I finally recognized a human face. That was a dream about my people and the poor insight in the world. Are there people who are willing to open their eyes in this darkness to see the Palestinian human face? Throughout history, millions have marched to have their voices heard. Human beings often make sacrifices for the sake of their values or on behalf of others for whom they care. When such persons die, they are glorified and considered to be martyrs to their cause. Why should it be so different when such persons are killed by Israeli forces? Two months ago, Arnaud Beltrame, a French policeman, exchanged himself with a hostage in a terrorist attack in Trebes; he was unfortunately killed, but his behavior was lauded as brave and heroic, not suicidal. The great march which started on Land’s Day and continues as I write this text, on the bitter occasion of the establishment of the American Embassy in my occupied city of Jerusalem, is meant to celebrate the 70th Anniversary of the Nakba. This march signifies the special meaning of this land to the Palestinians. Whereas some landowners may regard their lands as mere property that generates economic profit and can be exploited for water, energy, and food, the Palestinians feel otherwise. As a landless people, the Palestinians view land as an aspect of their own souls, representing their injured identity. Attached to their land with deep emotion, many Palestinians are ready to die for it. Advocacy, strategies, planning and calculation of risks are needed so that Palestinians do not need to be killed in order for their plight to be recognized. Premature judgment, psychiatric labeling, or exploitation of self-sacrifice cannot advance understanding of this plight. Land is the material space for the life story of Palestinians, as with all people. Let there be space on earth for the Palestinians, so that human beings will not search for their life stories underground. It is a great anguish that so many Palestinians are killed in defense of their dreams. Our only solace is to believe that if they have left us by choice to sleep forever, they continue somehow to pursue those beautiful dreams. All images in this article are from Middle East Monitor.